Phoenix Neoprene Spraydecks Ltd is a small company based in Nottingham since 1993. The company manufactures spraydecks from neoprene material. 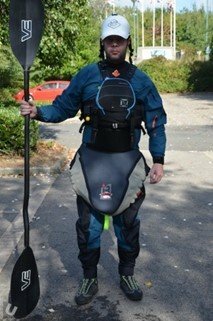 This is a piece of equipment that fits around the hole you sit in (the cockpit) and around the waist of the paddler to keep water out of the kayak. There is a wide range of sizes. A hole is cut out of the cockpit shape and a rectangular piece of material is then adhered to the hole edge to edge to form a body tube. Shockcord is stitched to the edge of the spraydeck which is elastic and can be stretched over a corresponding lip (cockpit rim) on the kayak deck to form a tight seal. With an increase in the uptake of the sport of white-water kayaking, there is an increase in the demand for spraydecks. White water can be particularly powerful and there is always a risk of the spraydeck releasing inadvertently, which in the wrong place can be devastating. In particular, the shockcord is prone to failing on higher volume water or on impact at the bottom of waterfalls. The company needed to find a better means of attaching the spraydeck robustly to the kayak. There are solutions used by other manufacturers, involving adhesive, but the joint is not particularly aesthetically pleasing and still tends to fail. The company wanted to use a rubber extrusion to attach the spraydeck to the kayak in place of the shockcord, but off-the-shelf extrusions were not fit for purpose. They needed to design a bespoke extrusion, which could be sewn onto the edge of the spraydeck and fitted onto the cockpit of the kayak as a continuous loop. This solution was likely to be expensive, as tooling would need to be designed and made. The company knew that if they could develop the right extrusion and prove a much better attachment and therefore improved kayaking experience, they would enjoy increased sales and become the market leader, which would also enable them to create new jobs. Joel Scott, Director of the company, approached The iNet and applied for grant funding from their ERDF Growth through Research for Transport Equipment Manufacturing (GTR TEM) programme towards the cost of development of the new extrusion tooling. The company was awarded a grant and were able to have the new tooling designed and made. On-the-water testing of the prototype continues. Initial response is very positive.